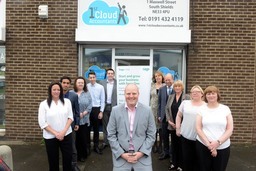 Our Business 1st Cloud Accountants have offices in Sunderland and South Shields, but have clients throughout the UK. Come and join a fresh, modern and up to date firm of accountants where the clients really feel the benefits. 1st Cloud Accountants are offering innovative services by utilising online accounting systems, but backed up with local offices and expert knowledge. 1st Cloud Accountants are a Sage One Gold Partner and a Sage Accounting Partner and are actively assisting businesses to move their accounts into the cloud for free.